Bible stories are great to teach your Sunday school kids about the word of God, but teaching them facts along the way are great too! It's amazing how often I set down to study my Sunday school lesson for my young class only to find I've learned two or three things I didn't know myself. I'm sure you've been there too. During this lesson, I hope you learn something as well as teaching your children in Sunday school this week. 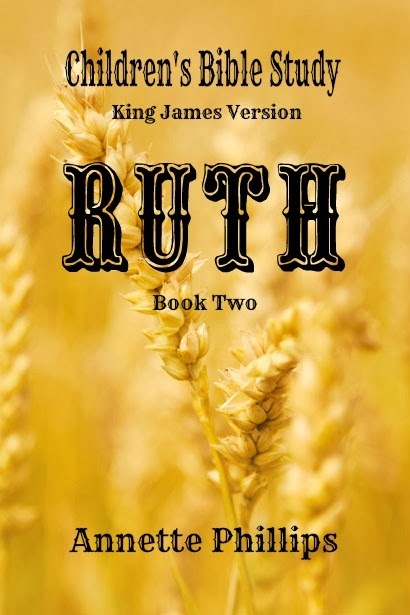 The people of Israel wanted a king, so God gave them Saul. One of the cool things about Saul was that he was secretly anointed by Samuel. The bible tells us that Saul was tall and handsome. When I think of a king, I think of a tall, handsome man, do you? Ask the kids in Sunday school what they think a king might look like. Wait for answers. 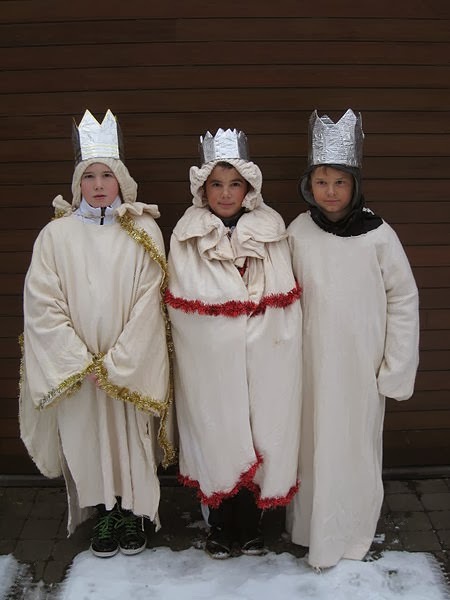 If you have a crown or kingly clothes (maybe from a Christmas play), you could let the kids dress up like kings during the lesson or after. You could even play the "The King Game". When Saul was made king, the people were not sure if this was the king they really wanted. Over time, Saul proved to be an able king and the people accepted him. Of course, being a king is hard and sometimes kings make bad decisions. Ask the kids, "Do you remember David who killed the giant Goliath?" When Saul was upset, David would play a musical instrument called the lyre to sooth him. After David killed Goliath, David began to become popular with the people and Saul became jealous. Saul became so jealous he wanted to get rid of David. Jealousy is a bad thing and never leads to anything good. Ask the kids, "Have you ever been jealous?" We've all been jealous at one time or another of someone else. Think about it - maybe you've been jealous of someone's grade on a test. What about the clothes they were wearing? Maybe your friend plays football, but your parents won't let you? You could also be jealous of a brother or sister not getting in trouble when you think they should have. Jealousy comes in many forms and you have to watch out for it. Whenever you feel like you are jealous, stop and pray that God will help you. After many years, David became the second king of Israel. He was a great king and wrote many psalms in the bible. David not only killed Goliath and played the lyre, he also had seven older brothers which means he was the youngest. 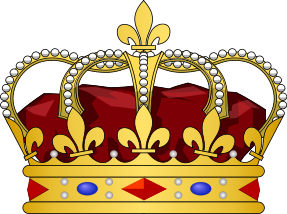 In most cases, when someone becomes king, it is the oldest son - not the youngest. In David's case, he was not only the youngest, but his father wasn't a king either. How could David have become king when his daddy wasn't a king? Wait for kids to answer. The answer is through God. As you've leaned before...for with God, nothing shall be impossible! David was king for 40 years and died when he was 70 years old. 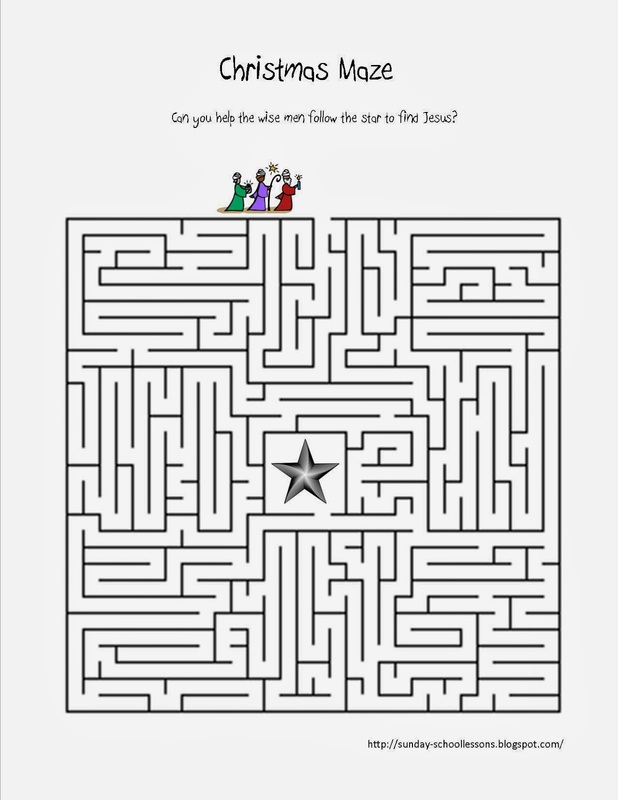 Here is a quick and fun Sunday school game for your kids to play this week. The only thing you'll need is some king clothes. Many Sunday schools already have king costumes from past Christmas plays which work great. If you don't, you can make a few crowns an use some clothes you have lying around the house. You can use the Sunday school game below with the Sunday school lesson about Israel's first kings. Depending on the age children, you can add more pieces of clothing or fewer. It is best to use fewer pieces of clothing for smaller children and more pieces of clothing for older children. Pile all of the clothes, jewelry, sandals, crowns, and anything else you have into a pile in the middle of the room. Make sure you have a whole outfit for each player. If needed, allow the kids to go in two or three groups so that everyone has a chance to put on the full set of king's clothes. When you give the signal, each player will race to the pile of king's clothes, find the pieces of clothes needed for an entire outfit, and put them on. The child who finishes first wins! You could have several rounds of this game to find the overall winner or just play for fun. Be sure to have your camera ready. This game gets a bit wild and crazy! While the wise men didn't follow the star to the manger like many nativity scenes and Christmas plays suggest, they did follow the star to find a young Jesus at his home with his mother (see verses below). Add your email to the right to get FREE stuff! 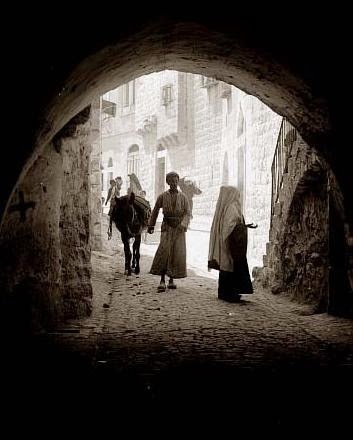 In the verses, you will find where the wise men came to the house and they found the young child with his mother. It does not say they came to the manger and found the babe. It is important for your Sunday school class to know bible facts as well as the bible stories. No matter what age (even pre-school aged children) need to know the correct version of the First Christmas from the beginning to the end. Otherwise, they will grow up confused and not sure what to believe about many things in the bible. Reinforce bible facts each and every class. I've had children argue with me that they know the wise men came to the manger because they have a story book at home that they read it in. It's fine to have and read bible stories that isn't exactly right. Why? You can use it as a lesson. For instance, say, "Did the wise men really come to the manger?" or "Was Jesus really born in a barn?" These questions allow you to teach the children even from a story book. Get more Sunday school activities! We have lots of FREE Sunday school activities. 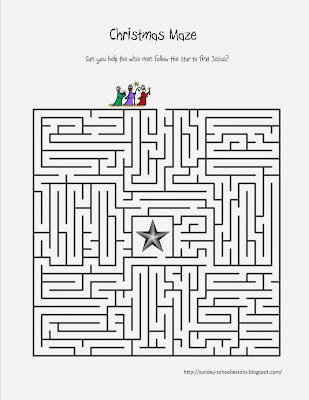 You can even use mazes and word searches to teach lessons. Think outside the box and keep the kids wanting to learn more about Jesus! I often find myself needing something extra for the kids in Sunday school to do. Sometimes kids come early and need an activity to do to keep them busy or sometimes the story is a bit shorter than I anticipated. There have been times I have made games up on the spot while other times I have the kids read over bible verses we have printed on the wall. At Christmas time, it can be fun to have an extra activity especially designed for the holiday season. Sign up to the right to get FREE Sunday school material! 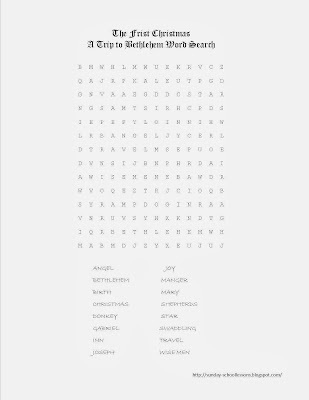 The word search below was made with the "First Christmas" in mind along with making sure Sunday school teachers have what they need to keep the kids learning about our Lord Jesus Christ. If you print this out and run out of time, send it home with the kids to do. You could even tell the kids to work on it with their parents or siblings. As they do the puzzle together, tell the kids to talk about what each word they are searching for has to do with the First Christmas. You can also do this in class together. Reinforcing your Sunday school lesson and the Word of God helps children all parts of the story better. Every Christmas my kids come home from school with crafts that are designed for the Christmas holiday. Of course, none of these Christmas crafts show the true meaning of the holiday season. For instance, we have Rudolf the red-nosed reindeer, Santa, elves, sleighs, bags of toys, and Christmas trees. Before going on - sign up on the right to get FREE ideas and lessons! While these are fun to think about and even enjoy in small quantities, the true meaning of Christmas is the birth of Jesus. I personally like the curled arms in the video below! Kids love to make crafts especially if they can give them to a parent, grandparent, sister or brother as a gift. This year, let your Sunday school class make a few crafts - one for the tree and another to wrap as a gift for under the tree. Here are a few Christmas craft ideas to help get you started. I've added a few links and some videos to help with your Sunday school crafts this holiday season. These are great to use as Christmas ornaments when they are small or make them bigger as a wall decoration! If you have large foam squares or even construction paper, kids can use the foam nativity stickers below to create their own Bethlehem scene. Each child can interpret what they think Jesus' birth may have looked like. The set below comes with 500 pieces which is great for larger Sunday school classes. We have a small class and just put the unused stickers away and use them again year-after-year. 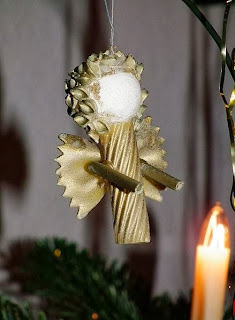 This Christmas craft idea can be made by each individual child using the smaller version in the video below or you can make a larger one for the Sunday school classroom. If you choose to make a larger one, let all the children participate in the making of it. 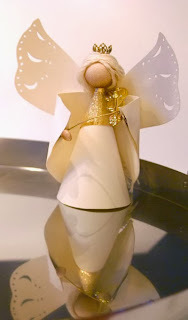 I've added links to some of the items you may need if you will be making this Sunday school craft idea for Christmas. It's best to prepare the popsicle sticks for smaller children before the day you will be making them. Just in case you'd rather have a ready-to-go craft for all different aged children, we've added the crafts below. They are simple to put together and can be made in a short amount of time. Remember the days of working with pasta? I used to go to church camp and every year we made something out of pasta. So, not to break the tradition - here is an angel pasta craft idea. Have fun with this one and use your imagination. I love the solid gold one! So many Christmas traditions surround the holidays that often the true meaning of Christmas gets lost in the shuffle. What is the first thing that comes to mind when you think of Christmas? Is it the lights, the presents, the hustle and bustle of Black Friday deals, getting together with family, Santa Claus, Christmas music, or old Christmas movies? The list could go on and on, but the first thing that should pop into our heads (and stay there) is the birth of Jesus. Stop right now and sign up (to the right) to receive FREE Sunday school material! Imagine, it's a dark night and you are alone in your bed. You are awoke by a bright light. As you look around, you see someone in your room whom you've never seen before - an angel. You are scared. What should you do? Should you run or scream? The angel begins to speak to you and you calm down and know that this angel is bringing you a message from heaven - a message from God. This is what happened to Mary, Jesus' mother. She was scared, but thankfully she didn't run away. Just like the scene above, Mary received a surprise visit from the angel Gabriel. The angel had come with a message from God. Gabriel first told Mary, 'Don't be afraid. I have good news for you'. You see, Mary was very special to God and needed her to be the mother of Jesus. Gabriel had come to tell her the news. Imagine - out of all the women (or girls) in Israel, Mary was the chosen one. Mary didn't understand how she could have a baby right now. If only we would say, "Yes Lord, whatever you say, I'll do it." It can be hard especially if it means being nice to another child at school, minding mom or dad, or even not arguing with your brother or sister. We should all try to be more like Mary and do what God needs us to do. Gabriel also told Mary that her cousin, Elisabeth, was also going to have a son. This was also a miracle because Elisabeth was old and had never had any children. The bible tells us that Elisabeth's son was to be called John (later known as John the Baptist). His job from birth was to tell others about the coming Messiah (Jesus). Mary wanted to visit her cousin Elisabeth and set out on the journey to see her. Mary stayed three months before journeying back home to tell Joseph about the coming baby. When Mary told Joseph about the angel's message from God and about the coming baby, Joseph was unsure of what to do. Should he still marry her? Joseph worried. 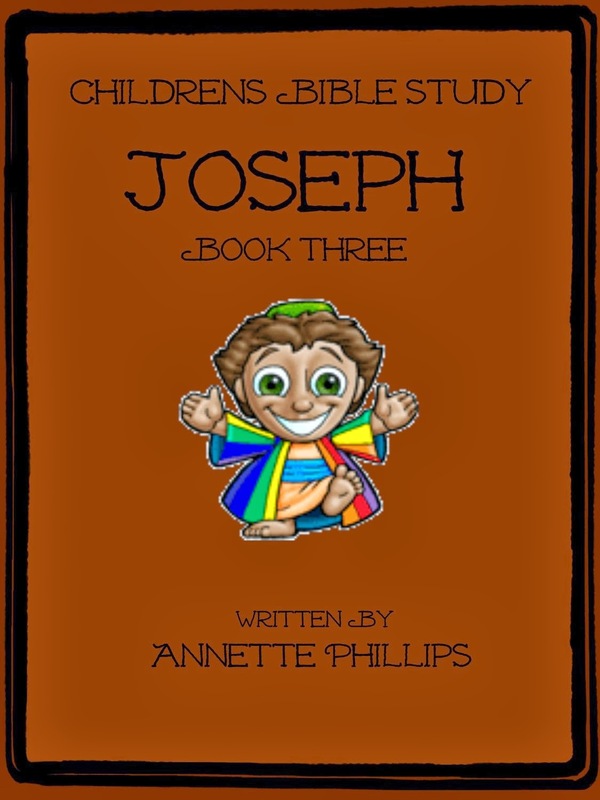 One night while Joseph slept, Gabriel came to him in a dream. The angel told him not to be afraid to make Mary his wife. This dream was all it took for Joseph to marry Mary. You see, Joseph was to help Mary raise Jesus. So, Joseph and Mary set off on their long journey to Bethlehem. When they arrived at the city, it was crowded because of all the other people who had traveled there to be counted. Every place was full. The bible tells us that there was no room for them in the inn. Where would they sleep? It was time for Mary to have baby Jesus. There were no hospitals. There wasn't even a room inside a house where she could lay. What would they do? Because there was no room in the inn, Mary delivered baby Jesus, wrapped him in swaddling clothes and laid him in a manger. We don't know if she was in a stable or a cave of some sort which was where stables normally were in those days. 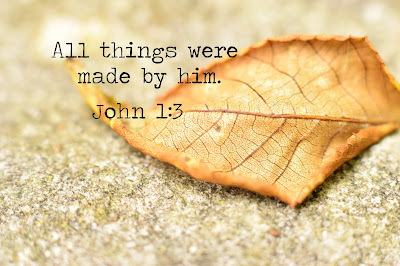 We believe this may have been the case, but the bible does not say. She may have given birth out under the stars. The story of the birth of Jesus is surrounded with many wonders which goes along with the wonders of the Christmas holidays. There is so much we can learn, but for younger kids stick to the basics (below). For older kids, you can dig a little deeper into the story. We learn that no matter how scared we are if God needs us, we should be willing to obey - just like Mary. We also find that Jesus wasn't born in a fancy house or expensive hospital. He was born and laid in a manger. A manger is a place where the animals eat their food. It probably was dirty and smelt bad. Mary didn't have a warm soft blanket to wrap Jesus in either. Instead, she wrapped him in swaddling clothes. Swaddling clothes are strips of cloth that often were used to wipe down the animals with. Jesus didn't have expensive clothes. We often think we have to have the best clothes or the newest styles. If Jesus didn't have to have expensive clothes, we sure don't either. This holiday season, don't focus on how many toys or clothes you get. Instead, focus on the birth of Jesus and how many people you can tell the story to.